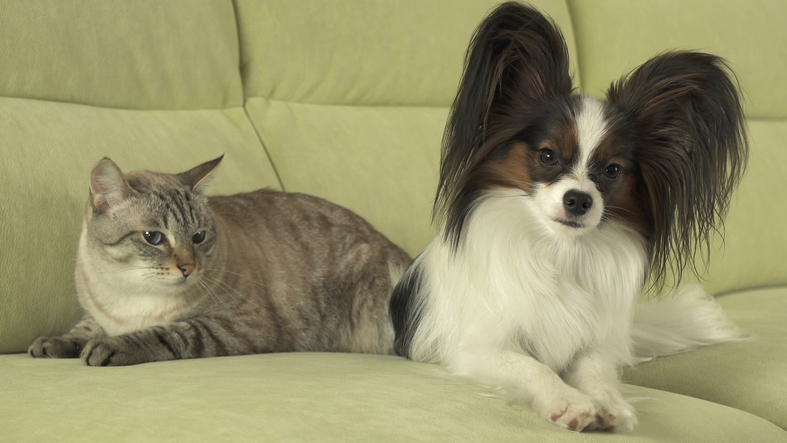 There might be a little truth to the age-old rivalry between cats and dogs. They do have differing natural tendencies, as well as some language barriers. But in many cases, cats and dogs can become loving family members — or at least tolerate each other living in the same home. VetStreet has assigned cat friendliness ratings to its directory of dog breeds — with the higher scores meaning the breed in general has a “tendency toward a tolerance for cats and a lower prey drive.” It must be noted that every dog’s personality is unique — influenced by instincts, as well as training, socialization and other life experiences. Still, if you’re looking to adopt a dog who’s likely to do well with cats, check out these 15 breeds (or mixes of these breeds). The easygoing basset hound tends to be a friend to just about everyone. “As a pack dog, he’s full of team spirit,” VetStreet says. 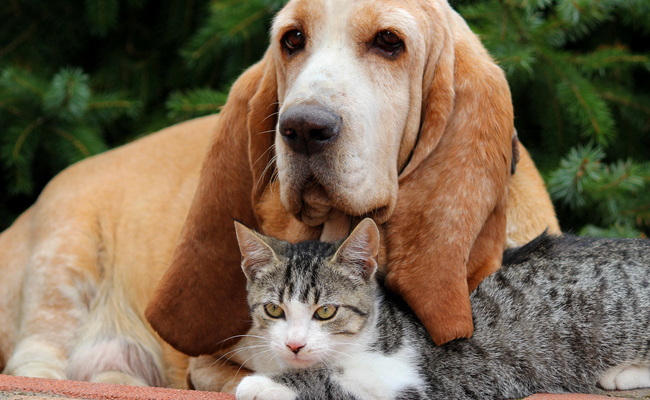 “His motto is ‘The more the merrier,’ and he enjoys the company of people, kids, other dogs and cats.” As long as your cat is tolerant of a moderately playful dog — and some classic hound howls — they generally should do just fine with a basset hound. Although the black and tan coonhound is in fact a scenthound with a prey drive, they still can be socialized and trained to live in harmony with other animals. “He’s great with kids, although he might be a bit too rambunctious for toddlers, and he can get along with other pets such as cats if he’s raised with them,” VetStreet says. These hounds typically have a friendly temperament, and they respond well to food rewards during training sessions. It’s not too difficult to make friends with a bulldog, no matter what species you are. “Bulldogs are friendly, easygoing and get along with everyone, including children and other animals,” according to VetStreet. They do well with young families and older adults alike, and they’re suitable for apartment living. Just be sure to give them an air-conditioned life — as overheating can lead to serious health issues for the breed. Both the Pembroke and Cardigan Welsh corgis tend to do fine around cats. 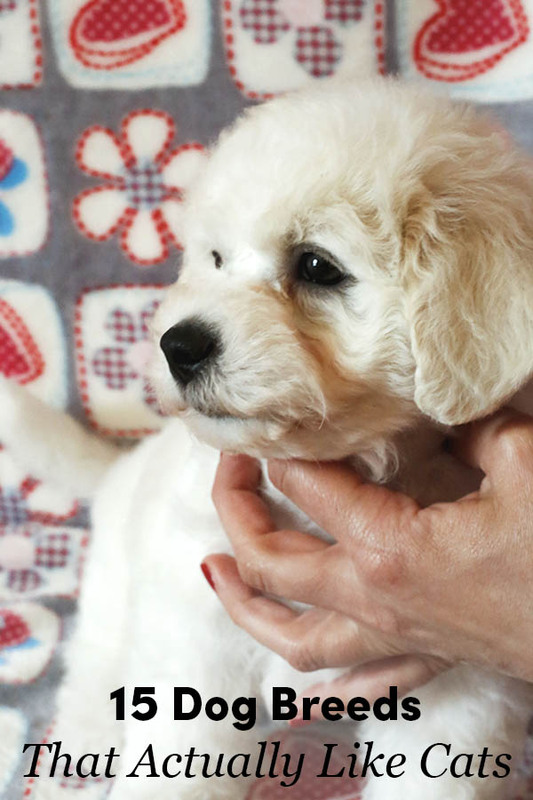 “His moderate size and activity level makes him adaptable to any type of home or family, and he’s sturdy and tolerant of children and other pets,” VetStreet says of the Cardigan. “In fact, the company of another dog or a cat is a big bonus for him.” But these dogs do still have strong herding instincts, so it’s important to make sure they’re not stressing your cat by trying to herd them. Give your dog some training and your cat some escape routes, and they should tolerate living together. Another bichon cousin, ancestors of the Havanese arrived in Cuba in the 18th century and evolved into a distinct breed from there. These little dogs have a big sense of humor and love to entertain. And their affectionate temperament allows them to get along with almost everyone — humans, other dogs, cats, etc. “Just don’t expect him to spend a lot of time alone: this is a dog who needs company all his life,” VetStreet says. The Japanese chin doesn’t just get along well with cats. This dog breed also has some classic feline tendencies. “People joke that Chin can fly, or that they are part cat, because of their incredible ability to reach high places,” according to VetStreet. “Some have been known to clear six feet.” They tend to be confident, quiet little dogs who prefer to perch somewhere up high to observe their domain. Sounds pretty catlike, right? The fun-loving pug aims to charm everyone they meet. “He is good with other dogs, cats, and children, and nothing makes him happier than being part of the family,” according to VetStreet. These dogs are only moderately playful and energetic, so they won’t overwhelm any feline residents. But like bulldogs, it’s necessary to watch them for overheating, as their flat faces can make it difficult to breathe. The Shetland sheepdog might look like a smaller version of the collie, but their origin actually is unknown. They might be related to the collie, as well as possibly the Pomeranian or King Charles spaniel. One thing is for sure: They are a herding breed with a tendency to herd or nip at moving objects. Still, these dogs are loyal and intelligent, and they love their families — even other pets. 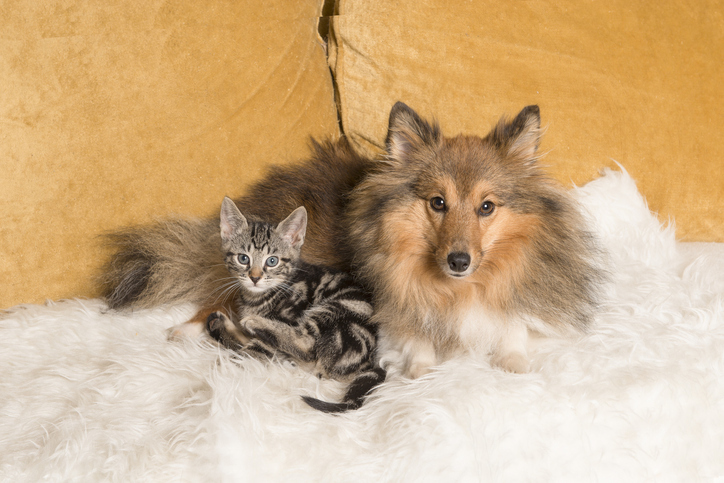 “Shelties generally get along with other dogs, typically seem to enjoy cats, and are fine with other household pets,” VetStreet says. 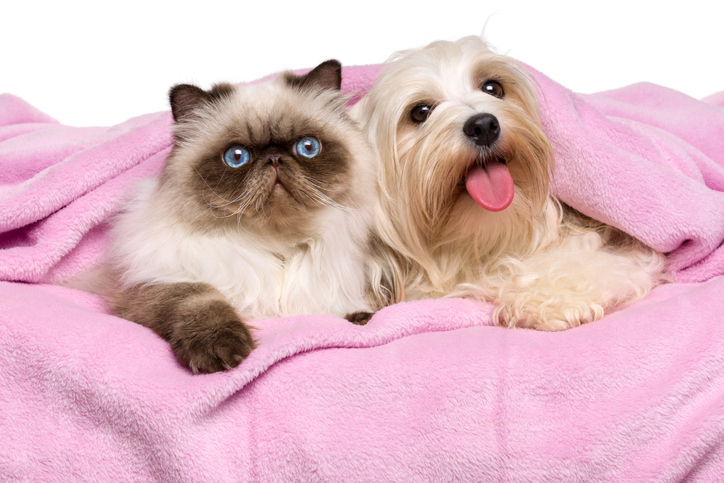 VetStreet gave several more dog breeds a high rating for their ability to get along with cats. 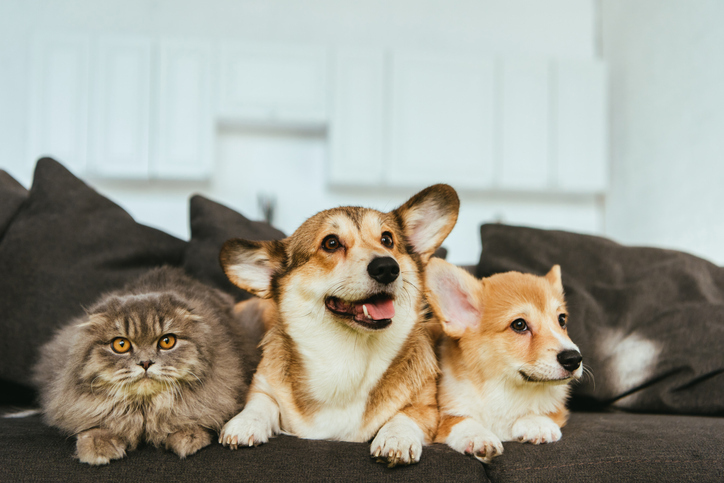 Many other small dogs — such as the Brussels griffon, Chihuahua, Lhasa apso, Lowchen, Maltese and Pomeranian — tend to do well with feline family members. And even some large breeds — including the bloodhound, Newfoundland and St. Bernard — can be gentle and coexist peacefully with cats. Still, it’s imperative to remember every dog (and cat) is different. And nurture will influence their ability to tolerate cats just as much as nature. An easygoing demeanor and low prey drive help, but proper training and socialization are key for any dog to safely live with cats. Notice Afghans are not on the list and mine are not at all interested in friending them as they are used to chasing off feral cats out in the bush. Upon saying that, both their grand mother and mother plus siblings live with a couple of cats and all get along well. I think it is the way of introducing them or both growing up together is they better way. Older cats will often befriend a puppy and sometimes an older dog will take in a kitten, but it is a harder job for two older animals that may view the other as an intruder. Our Toy Poodle gets on very well with our cats - one who she has grown up with and co-existed with since she was a puppy and he came into the house as a rescue of 6 months of age and the other just 2 years ago when she was a senior girl of 12 years of age - so all things considered, our full bred Toy Poodle has done very well to share her bed - and us and her home and the sofa and everywhere else without issue all these years - its very rare she gets her knickers in a knot with the old boy and that tend to be in protective mode with the younger one funnily enough! They are all beautiful and are a delight - we love each one dearly and cannot imagine life without the three of them. Just make sure to ADOPT, don't buy a pet! She plays with mine, eats their food and poops in the litter box. By the way the reason I haven 't been doing this , my little mama presented me e with six adorable babies Anyone want akitten?